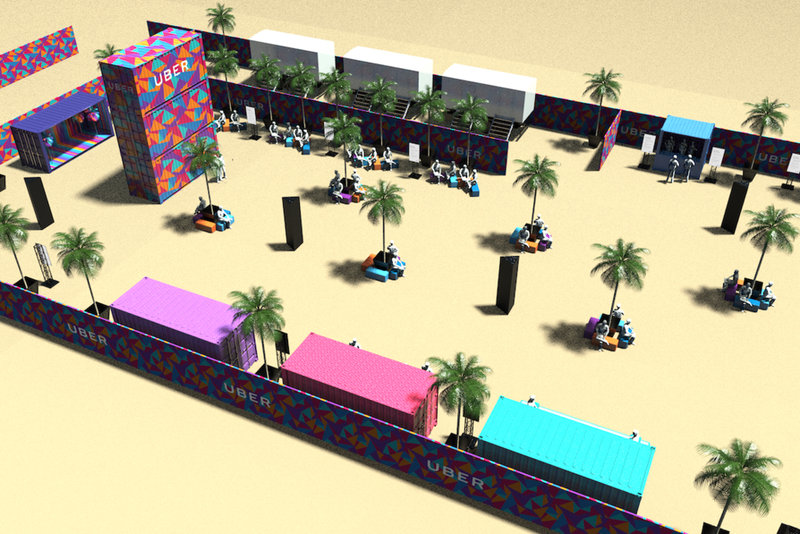 Uber was looking to make an activation space at the Coachella Valley Music Festival. 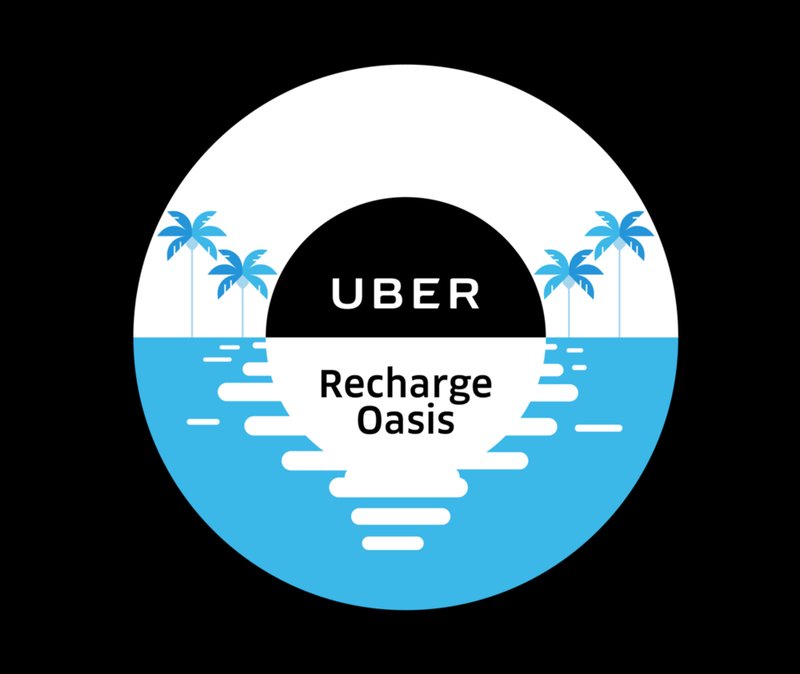 This would serve as a place for Uber passengers to recharge before booking rides leaving the event. 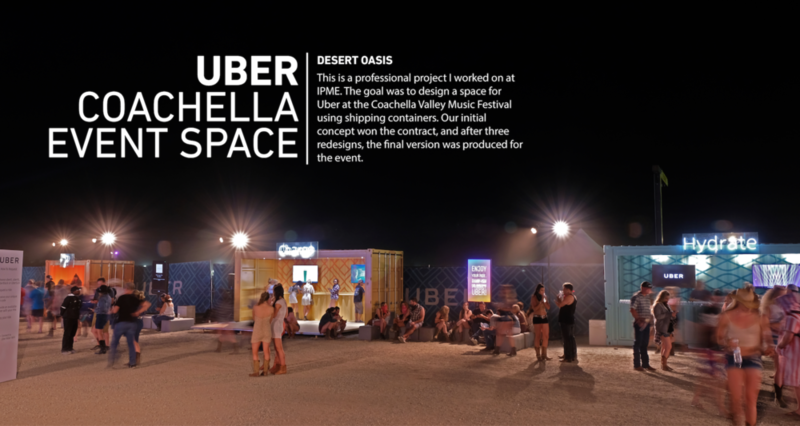 The space needed to be exciting and represent the Uber brand. 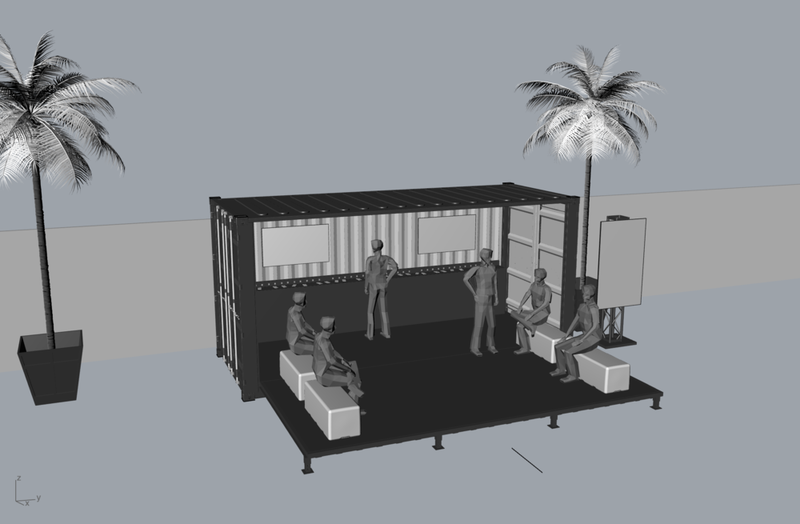 Early on, the goal was to win the contract by first pitching a concept utilizing shipping containers. I was supplied a rough plan view drawing of the overall space. After making a few adjustments, I imported the drawing into Rhino and scaled it 1:1 to quickly model and visualize the space. 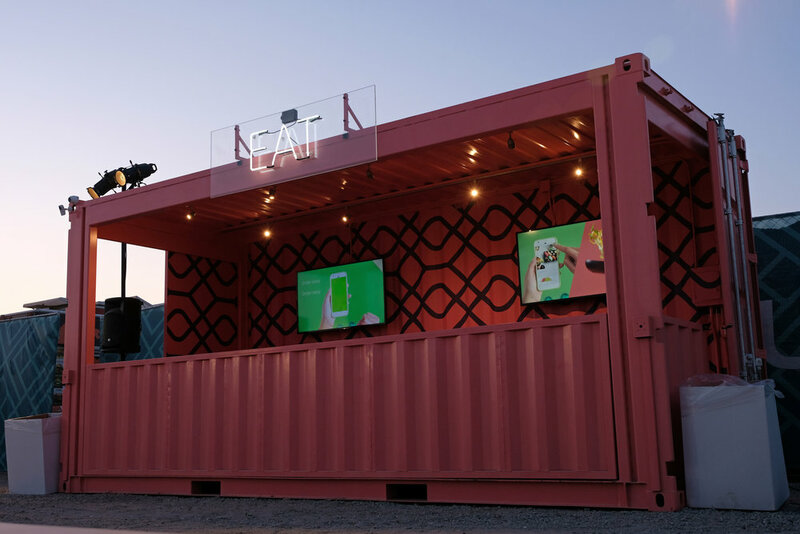 Each container at the event was designed to serve a unique purpose. 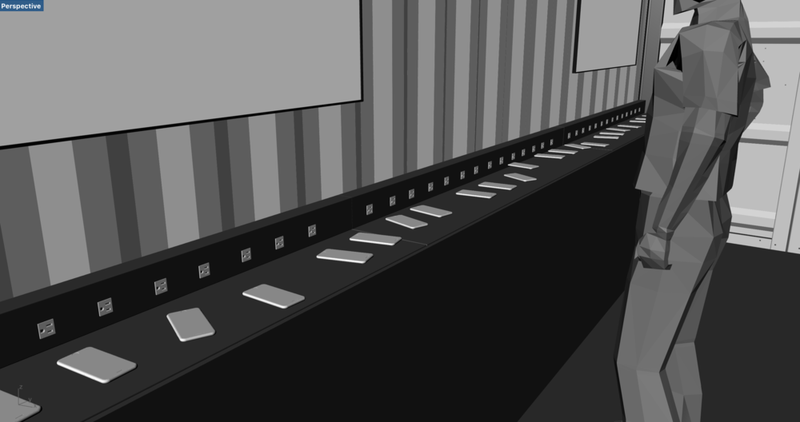 For the recharge station, I chose to add a shelf on the back wall with a row of charging outlets. This would be relatively inexpensive and easy to build, while still being a step-up from the traditional "charging cubes" used at many music festivals. The drop down wall also provided an extended area for seating. 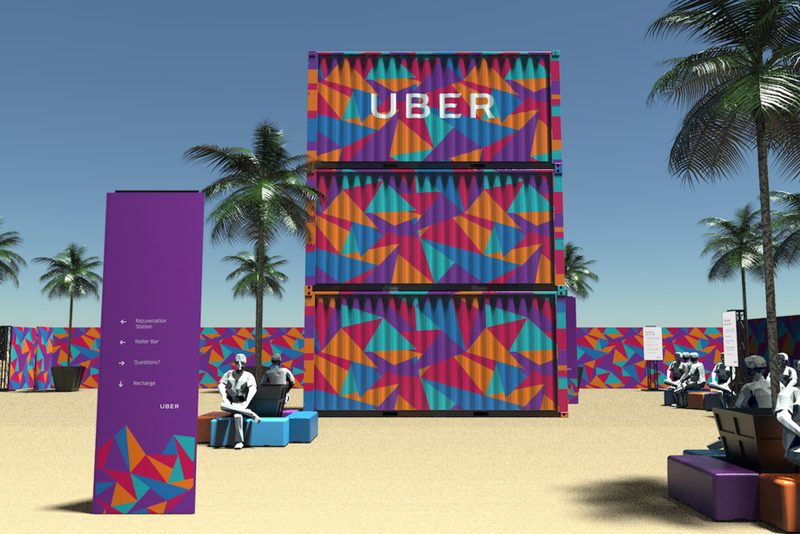 The graphics I created for the space would need to match Uber's overall brand and visual identity. I began by studying their current brand guidelines, as well as referencing recent executions and case studies. Combining Uber's color and art deco illustration style, I created a logo to represent the space. This would become the driving theme for the other graphics in this concept. After fine tuning the 3D model, I added textures in KeyShot to bring the scene to life. 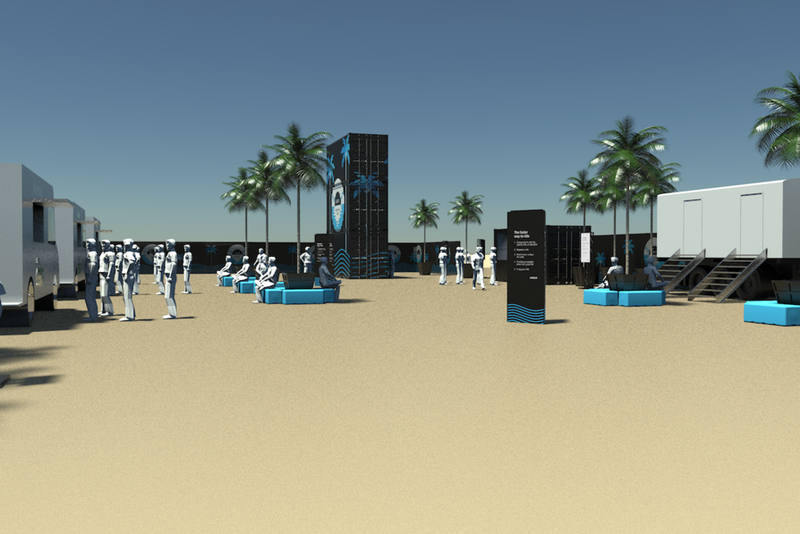 These renders were then presented to Uber, and ultimately won us the contract. Although Uber loved the initial concept, they had just begun redesigning their brand for 2018. The new brand used a broader color spectrum and dynamic patterns. I was asked to redesign the concept's graphics to reflect the new changes, and integrate my own geometric repeating pattern. To create the new graphics, I began by experimenting with different repeating geometric patterns . The new concept reflected the brand change and included the geometric pattern I had worked on. Certain physical features in the layout were updated as part of my instructions. I was given two days to make the revisions. After meeting with Uber's Los Angeles division, the final details on colors, patterns, and physical layout were decided. 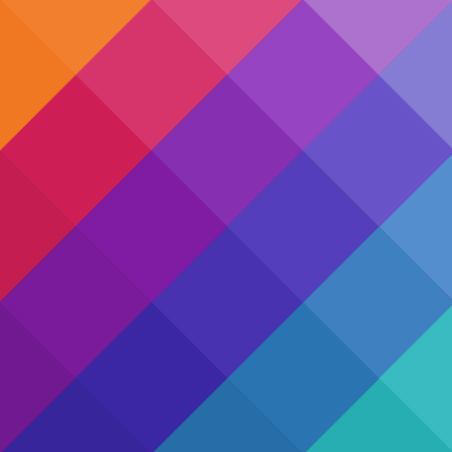 The final concept would be slightly toned down, but would still feature most of the colors from the previous concept. There would be no triple stack of containers due to Coachella's regulations. 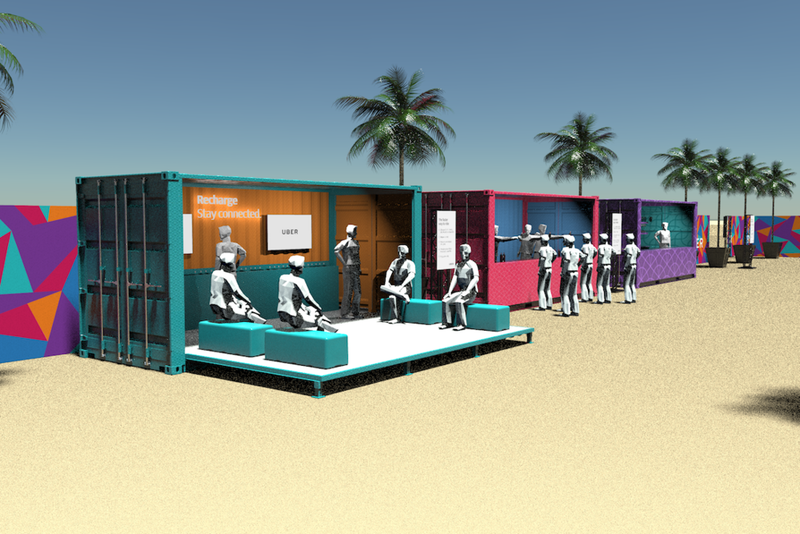 With the final concept approved, we began constructing the stations out of shipping containers for the event. Electrical, lighting, and flooring would all need to be installed. It was important that the container paint colors followed the palette supplied by Uber. I pulled swatches from a Pantone guide book and crosschecked them against paint sample sheets from our paint supplier to make sure they matched before painting could begin.